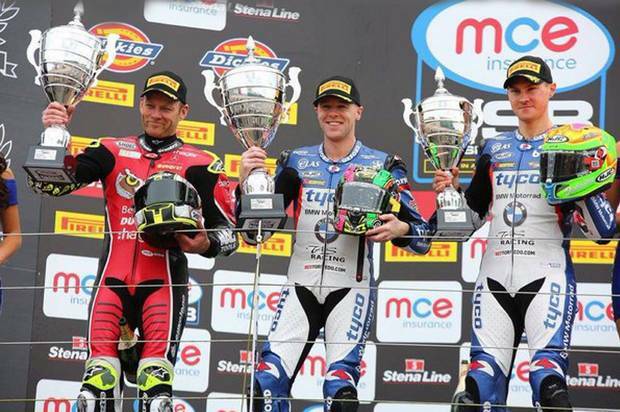 Motogear | BSB: Peter Hickman secures 1st place again and not one but TWO podiums for Christian Iddon at Silverstone! British Super Bikes 2016 started off in Silverstone on the 10th of April . Five’s sponsored rider, Peter Hickman finished in an outstanding 1st place whilst our Gaerne and Five sponsored rider, Christian Iddon, started the season with a very promising result; not only did he secure his first ever BSB podium, he excelled expectations further and hit a double- which indicates that Iddon offers some great things to come in BSB, 2016. Peter Hickman has achieved his 2nd BSB win of his career in an exhilarating fashion. It was a close call, for the forth-time BSB champion, Shane Byrne, was close on his tail and kept the competition invigorating to watch. Hickman’s persistence prevailed and he took 1st place podium with great satisfaction. In race 1, Iddon set off to a good start, despite the fact that he had opted for the harder of the 2 compound tyres. For the majority of the race, Iddon maintained a strong pace- albeit slightly stunted by the speed of the riders surrounding him. However, he managed to pick up the pace as he entered the 4th lap and with impressive determination, he reached the podium at a very gratifying 3rd place. In race 2, the weather conditions dropped, thereby causing Iddon to use a harder tyre on track. His start wasn’t as fortunate as it had been in the previous race ( he passed the 1st corner in 11th) but with excellent tenacity, Iddon managed to keep a focused eye on Five’s sponsored rider, Hickman (who was in the lead) and Shakey (2nd) and soon made his way onto their tails. Unfortunately, he was unable to defeat his competitors further and finished in another respectable 3rd place. We are excited to see what achievements both of our talented riders will bring as the season progresses.